Florence has an attractive historic centre, with some interesting architecture, including fine Renaissance palaces and the famous shop-covered bridge, the Ponte Vecchio. But Florence's most popular, most famous and most unique tourist attractions are those on display in the town's museums and churches. From Michelangelo's iconic and kitsch-ified David to the delicate paintings of Botticelli, Florence is home to some of the world's finest art. The birthplace of the Renaissance is now a crowded tourist honey pot packed with visitors being shepherded from one masterpiece to another. Florence is a place to attack with a shopping-list of attractions, not a destination for a relaxing, atmospheric Italian break. On this page we offer some tips for getting the most from your holiday, and will also be building a run-down of some the town's most interesting sights. EU citizens, take note: you may be able to save a fortune in entrance fees. There are major reductions available at most state-run and a few private museums for the young and the old. Those under 18 and over 65 years of age may get in free, while for students and those aged 18-25 there are often reductions. Bring your passport and any other ID to confirm your status. 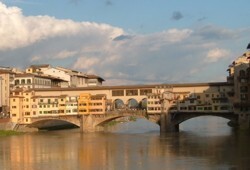 Museums with reductions/free entry include many of Florence's major sights: the Uffizi, San Marco and others. You will still have to pay any booking fees applicable. School parties also get in free, which may not please those whose visits are disturbed by shouting, smoking, mobile-phone-using teenagers. As discussed on our Florence home page, visitors to Florence can expect to part with large amounts of money. Even a relaxing hour in the Boboli Gardens is an expensive luxury. So (unless you qualify for free admission) come prepared to spend. It would be tragic to arrive and find your budget doesn't allow you to see all the sights. Decide in advance which are the most important attractions for you, and get an idea of how much they will cost. Make the most of what you do spend. Check opening times to make sure you don't arrive just before closing. If possible, visit first thing in the morning before the queues build up and galleries get crowded. Take a guidebook around with you, to help you find the important exhibits and to provide background information. Few museums are well planned and signed (there are plenty of fire-safety plans, but not many useful gallery maps), so explore stairways and dark corners and make sure you don't miss anything important. Don't be afraid to investigate, or to ask staff for directions - we have discovered whole galleries and museum floors this way. One last warning: don't invest all your hopes and dreams in seeing one particular work of art. Despite their massive revenue, museums in Florence frequently close one or more rooms/galleries with excuses like staff shortages. Details of galleries which are closed (chiuso) should be on display by the ticket desk; but this is not much use for tourists who are unable to return another day. Some exhibits may be removed for restoration (restauro), while other artworks may be on loan (in prestito) to exhibitions or museums in other towns/countries. And a final problem you may encounter is that Italian bugbear: the strike (sciopero). These problems can all cause frustration for the visitor, but are an unavoidable hazard of visiting Florence. You will still see a huge selection of some of the world's finest art. Florence's most renowned tourist attraction is the unmissable Uffizi gallery, which contains a wonderful array of paintings including masterpieces by Giotto, Fra Angelico, Filippo Lippi, Botticelli, Raphael, Titian and Caravaggio among many others. The Uffizi is part of the Polo Museale Fiorentino, the town's group of state museums, along with the superb Bargello sculpture museum, the Accademia (David), San Marco, the Medici Chapels and the excellent Archaeological Museum. These museums offer various reductions - see above. If the attraction in question is mounting a special exhibition, entrance fees may go up (regardless of whether you want to see the exhibition or not).